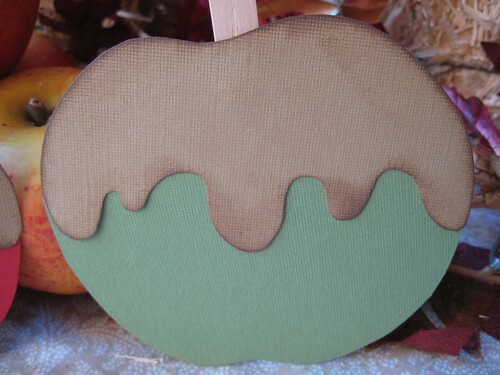 There is no place like home: Caramel Apple Cards ~ Paper Crafting Thursday! The winners of last week's paper crafting are Sherry and Lisa Ann. Please email me your addresses and I'll get your prizes in the mail! Welcome to this week's project! 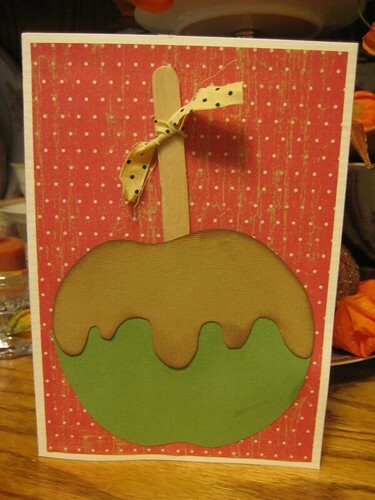 I have been having lots of fun making these caramel apple cards. They are quick and easy to put together. Cut it out, including most of the leaves on top. 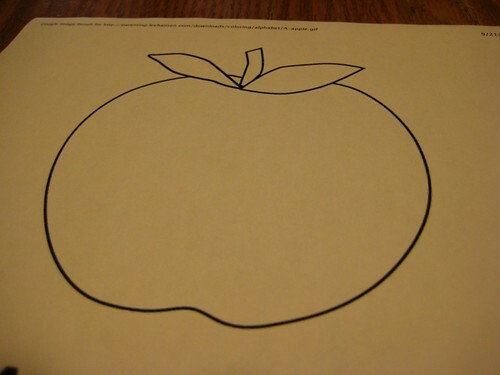 Trace *two* apples onto a piece of paper. 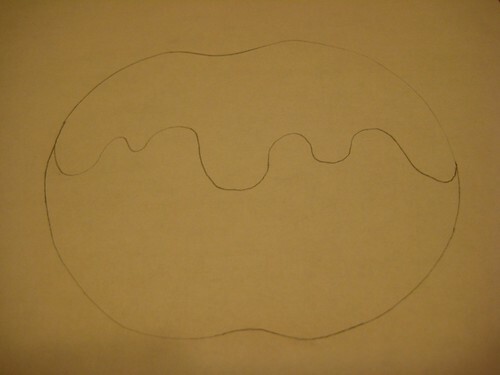 On one of the apples, draw a dripping caramel pattern. Be as messy as you like-it's hot caramel after all! 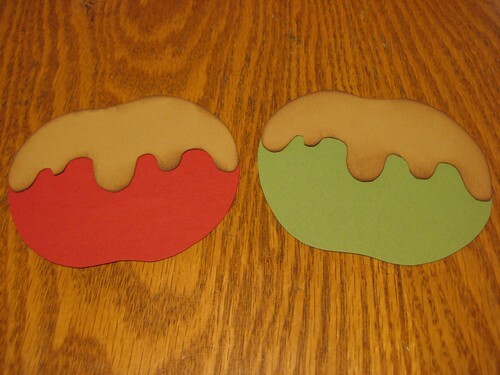 Cut out caramel and apple patterns. 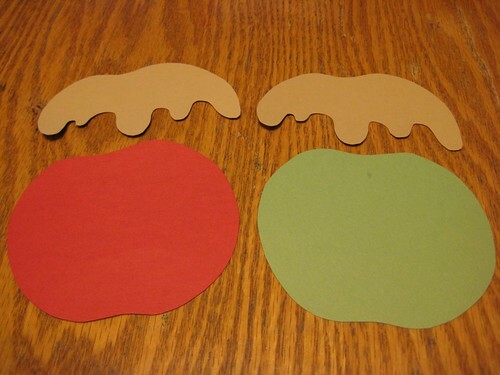 Trace onto brown and green and/or red cardstock. 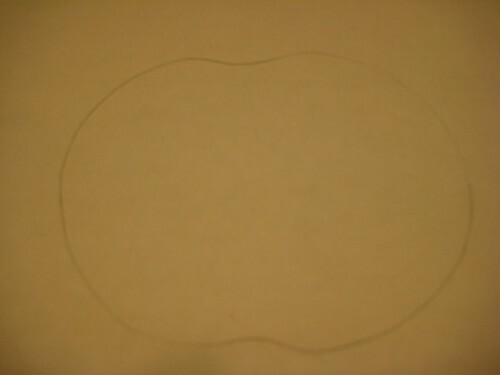 Shade the caramel edges with a brown ink pad, if desired. 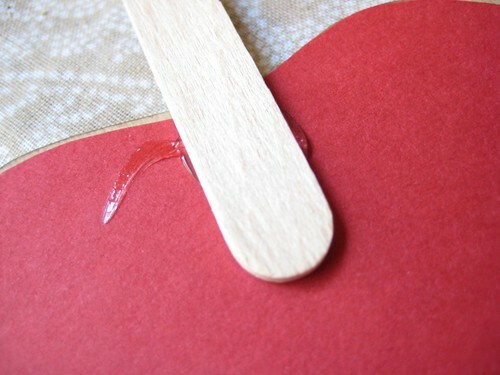 Glue caramel to front of apples. 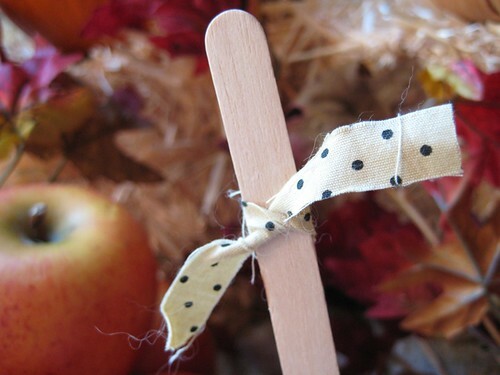 Glue a popsicle stick to the back. Tie on a little ribbon. 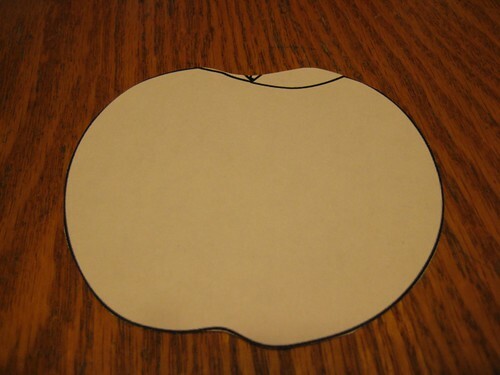 You can send to a friend as is, or glue apple to the front of a card. 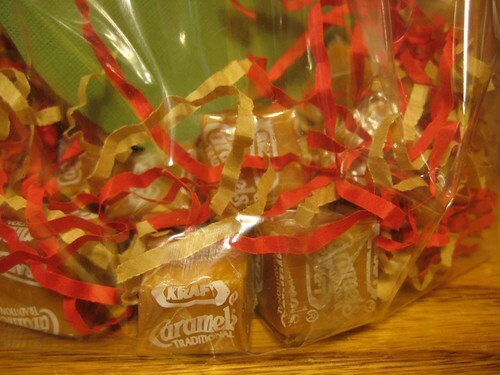 Another fun idea is to place your card in a clear goodie bag, along with shredded paper and lots of caramel candies! I hope you have enjoyed this week's paper project! Links are now closed. Please join us in the current week's post! Those caramel apple cards look good enough to eat. I love how you have wrapped them with the caramel candies. Just beautiful. Congratulations on opeing your etsy shop. I look forward to stopping by later for a look. Those are some of the cutest cards I've seen in a long time. those are wonderful :) so cute and creative! Honestly kelli - where do you get all your wonderful ideas from?? I am really amazed this apple card is the cutest thing I've seen for a long time! Oh those cards look great , good enough to eat lol..
Kelli, these are so cute! I have to get some caramel candy anyway for apple dipping, so we are going to make some of these for my hubby's office staff. Love those caramel apple cards. That is SOOOO CUTE! I love these! The ones in the goodie bags are such a cute idea, Kelli! You are so creative. I am just lovin' this! So sweet! I love it in the bag it almost looks like a real one! Yummm...Love em. That is a cute idea. HI Kelli! The cards are adorable. I made a couple of birthday cards yesterday using a some of your ideas. I am very proud of how they turned out. That is a great idea. I like the idea of it in a bag. Very creative. I'm going to have to try those!! 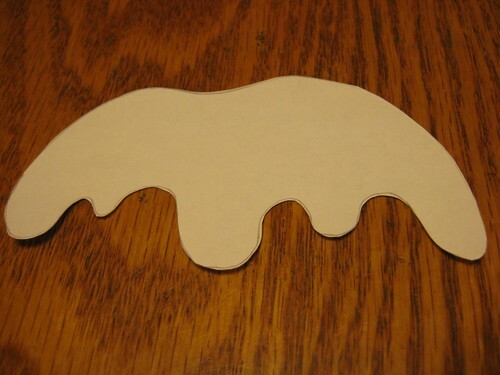 I'm usually not good at paper crafts but I think I could pull those off!!!! I started a new holiday blog...you can link to it off of my regular blog...stop by sometime and check it out! Ok I love all your cards, but seriously this one is just too adorable for words. Good grief, how cute can you get? Your cards are always a delight to look at, but this one is so incredibly unique. I love it! And I'll have to try it! Those are some of the cutest things I have ever seen! Those are the cutest cards ! Thanks for sharing this great idea. I am thinking of making these and putting in the clear bags with some candy in them for my childrens teachers and ladies at church -) Your so creative . Have a wonderful weekend ! Oh, enjoyed the camping pic's too. Looked so nice and peaceful..very pretty there too. I love those caramel apple cards. But what I love even more is that you give a tutorial AND sell them in your Etsy shop! What a gracious girl! Kelli, you're too much! I love the caramel apple cards and I'm so glad you've shared. May God bless you and keep you. Those are ABSOLUTELY AWESOME!! You've got something there, girl. You've been given a great talent, and you're sure investing it by sharing it with us. What an inspiration. Those cards are absolutely, positively adorable!!! Thanks for sharing these with us. I can't wait to make them with my kids! Oh my word Kelli these are the cutest things I have ever seen. I just love them! BTW good luck on the shop. I put my link up on my new blog. Those are just too darn cute! These are so clever and cute! What a cool way to share candy! I'm excited about your Etsy shop. May God bless your business. My entry for the paper craft includes a tutorial which I put on my art blog. I hope it's in the spirit of this feature? 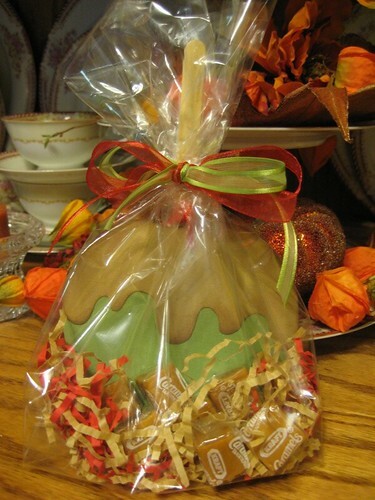 The candy apples are so cute, I especially like putting them in the bags with caramels! 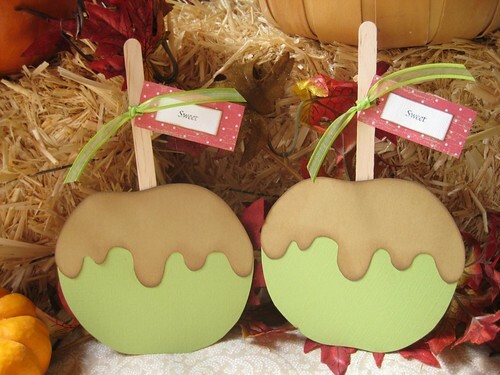 Kelli, your caramel apples are adorable. I want to makes some now. 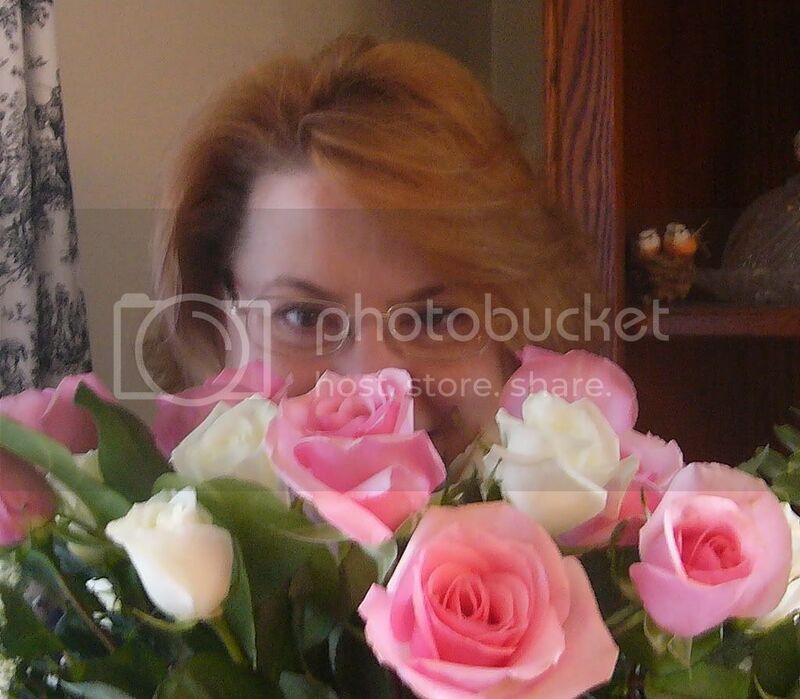 thank you for sharing this and I love your new site that you are selling things on. Thanks for all the fun ideas over here! Kelli, These have to be some of the cutest cards that I have ever seen. 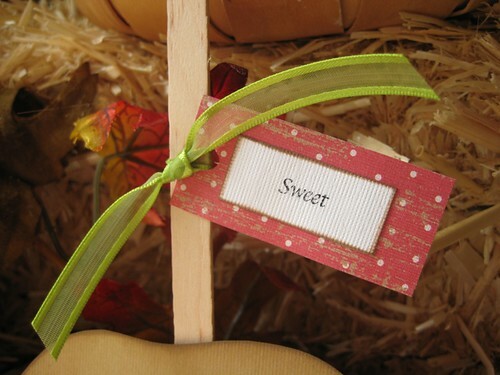 I love your little gift bag idea using the candy and card! What a sweet (literally,lol) gift for a secret pal or a "just because". Thanks so much for your idea! I hope you have great success with your new Etsy shop! Congratulations on your etsy shop, you will sell out fast! I love your caramel apple card, I could eat that card! :) I think this is one of my favorites, thank you for sharing! These are so cute!!! I absolutely love the idea! These cards are just adorable. I love your choices of color and paper. They are deliciously sweet. I made these cards :) They came out really cute. 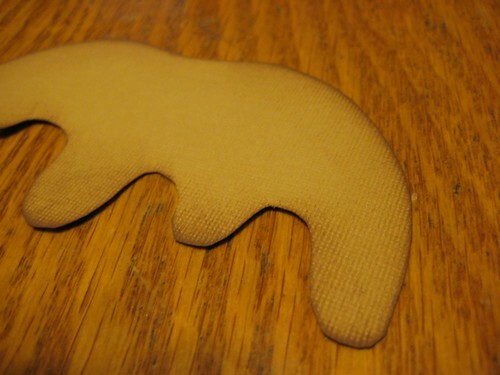 I'll be posting them on my blog when I get around to taking pics of them. I'll link back to your idea. what a sweet little gift..
What a wonderful idea for a card! They look so nice.